ARE YOU READY for SUMMERWEEN 2017? What could possibly improve the New Mexico summer season? How about celebrating Halloween!! The 4th Annual SummerWeen is coming up on August 19th at the Sandbar Brewery and Grill! If you love dressing up, dancing and eating great food, you won’t want to miss it! The best costumes will receive prizes, and there will be plenty of giveaways throughout the night! Enjoy all the amenities the Albuquerque brew scene has to offer as well as live music from some of the best local DJs. ABQ-Live and the Sandbar are adding tricks and treats to this summer heat! Tickets are $15 online or $20 at the door. Click HERE for further ticket info. Albuquerque’s own UFC superstar athlete Michelle Waterson is featured as the cover athlete in the 2017 ESPN BODY issue featuring many of sports top athletes. The issue hits stands July 7th. Waterson joins the likes of New England Patriots wide receiver Julian Edelman, Dallas Cowboys running back Ezekiel Elliott, and Chicago Cubs second baseman Javier Baez, along with many others in the 2017 issue. Big names in the past that have been featured include Conor McGregor, Ronda Rousey, Jon Jones, Miesha Tate, and Cris Cyborg. ABQ-Live the Magazine featured Waterson in an interview before her big win against Paige VanZant this past December. Watch some behind the scenes footage of her cover shoot with ESPN below. Albuquerque is hosting the 41st annual PrideFest this weekend. Everyone is encouraged to join the celebration of the LGBTQ community. Click here for event dates and times! As we enter the summer season, we have the opportunity to reflect on the history of Albuquerque Pride. PrideFest symbolizes liberation for the gay community. A lot of recognizable change has taken place over the last 48 years. In June of 1969, the Stonewall Uprising marked our country’s launch into the gay rights movement. Men and women protested for equality at the Stonewall Inn in Manhattan, New York. The building has since been named a national monument in honor of the pivotal change that took place there. Before the series of New York riots, individuals who didn’t see themselves as straight were encouraged to keep their sexual orientation to themselves. Judy Garland – best known for her role playing Dorothy Gale in the Wizard of Oz – was an early activist for equality. Garland’s support and acceptance of the gay community fostered hope for millions of people who were tired of hiding who they truly were. Rather than openly identifying as gay, they would introduce themselves as “a friend of Dorothy.” Her death in 1969 is rumored to have sparked the Stonewall protests. News of the rebellion spread internationally, and now the historical event is observed worldwide around the same time every year. Albuquerque’s first march for gay rights occurred in 1976. Less than 30 people walked in this parade. Although they were small in numbers, the tradition they began was carried on and has grown into the large celebration we know today. Every year, we continue to see progress in the equal rights movement. Events such as PrideFest help to raise awareness of the contemporary issues the LGBTQ community faces. These festivities also allow us to celebrate how far we’ve journeyed on the path to equality. We have witnessed a substantial amount of positive change in recent years, but there will always remain room for improvement. As we continue to take pride in who we are and what we stand for, we draw closer as a community. Imagine Thor without a hammer, Cast Away without Wilson the volleyball, or Back to the Future without a Delorean. These are only a few examples of movie props that have played essential roles in their films. Photo courtesy of Joshua Aragon – Actor Michale Shannon is propped by Aragon in preparation for a scene. Acquiring props for a production is possibly one of the most important jobs in the film industry. The coordinators behind each material detail on set are known as property masters, or prop masters for short. A scene cannot be shot without props. It is important to recognize that every aspect of a movie is carefully choreographed and planned. The presentation that audience members interpret is crafted down to the tiniest detail. This could be a bag of chips sitting on a counter in the background or a phone hanging on the wall. Audiences don’t typically pay attention to every single object in each scene, but it’s important to note that no object is naturally occurring. Everything we see has been placed by prop masters like Aragon. He has a script he follows, just like actors do. He thoroughly studies each of his scenes and manages all of the props for those scenes for the duration of the film. 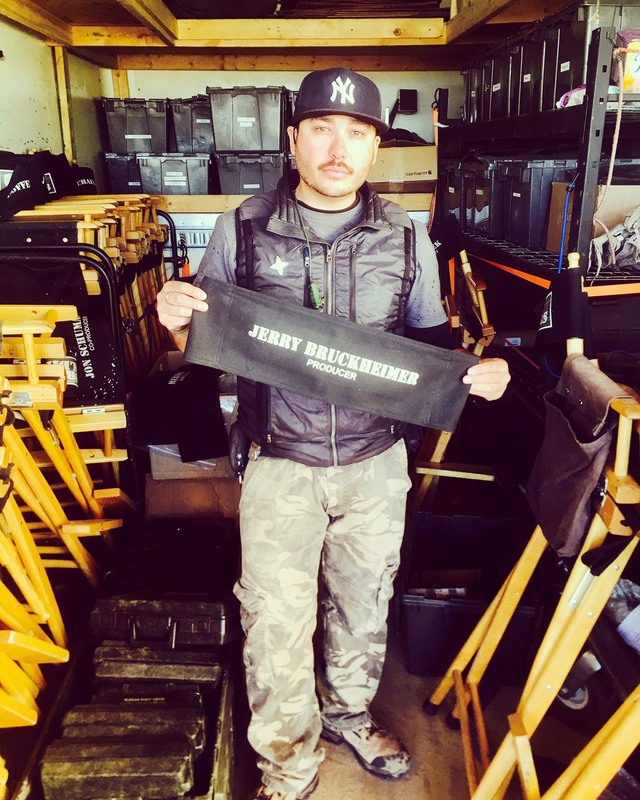 Aragon has worked on several sets for major motion pictures like Sicario and Maze Runner: The Scorch Trials. His involvement in such well-known productions has allowed him to interact with countless successful showbiz members. Photo courtesy of Joshua Aragon – Chris Hemsworth discusses a scene with Aragon on the set of Horse Soldiers. “I have been blessed to work with some of the biggest names in the industry,” he said. Denzel Washington, Jennifer Aniston, Chris Hemsworth, Mark Wahlberg and Jerry Bruckheimer are among hundreds of notable entertainers that Aragon has met while on the job. Photo courtesy of Joshua Aragon – Aragon poses alongside producer Jerry Bruckheimer. Although Albuquerque is his home, Aragon’s favorite perk to managing props is traveling. Movies are rarely filmed in one place, so he gets to see the country while also befriending his childhood idols. 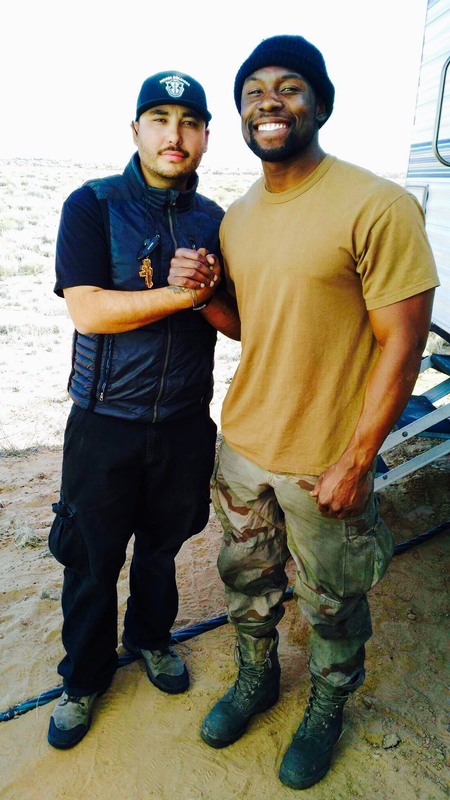 Aragon gives back to his Albuquerque community through his contribution to the film industry. “New Mexico benefits from film tremendously. We are constantly buying, renting and building props locally,” he said. His last film had a $600,000 budget for props, and 90% of those funds went to local businesses here in New Mexico. We don’t often think about the importance of props because they are abundantly present in every film. However, movies cannot be made without them. Aragon with award winning actor Trevante Rhodes. 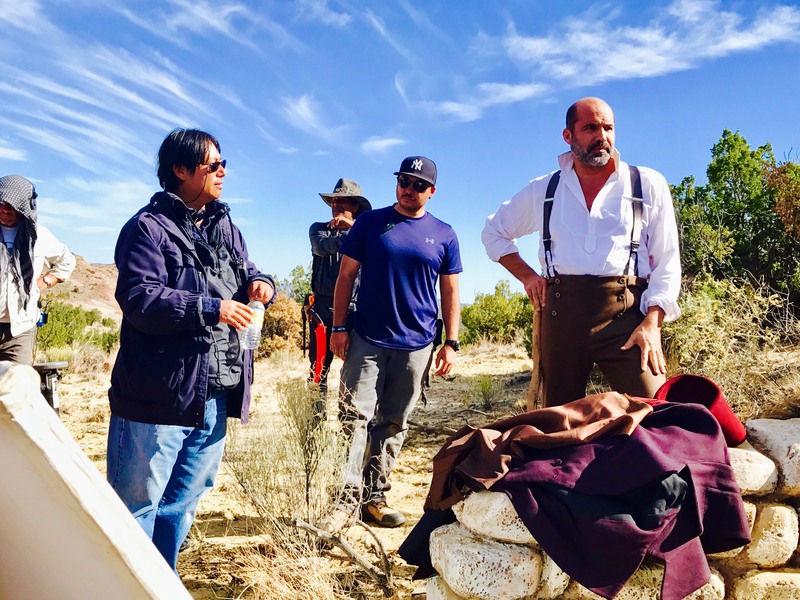 Aragon with Billy Zan and director Van Ling. Aragon with Eva Longoria on the set of Frontera. Aragon working on set with Jerry Bruckheimer.